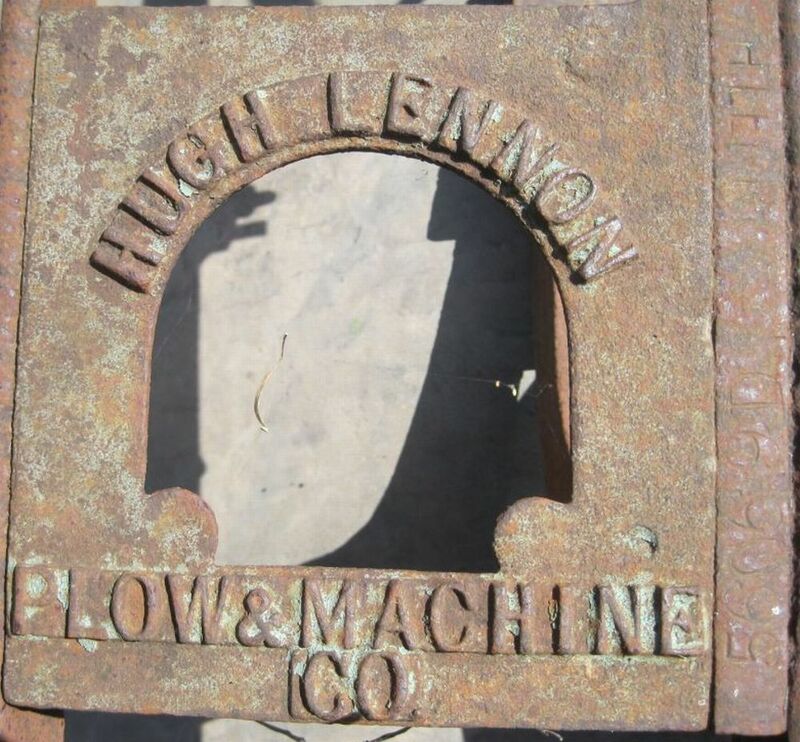 Malleable spanner marked only "Cast Steel"
Lennon Bio and short Company History. 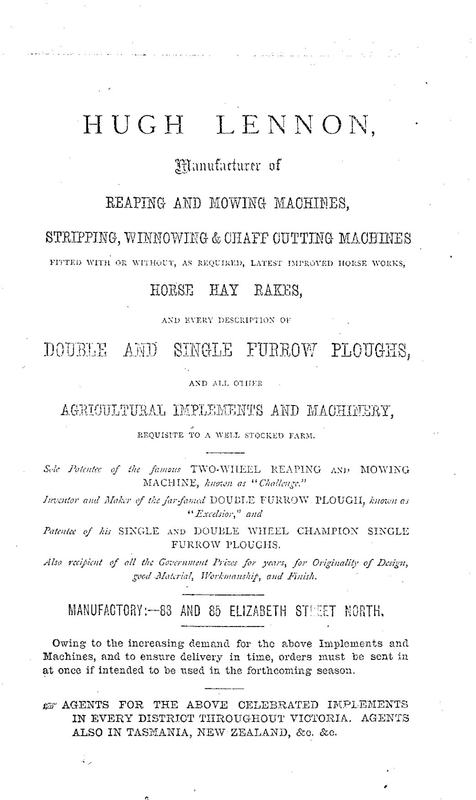 Hugh Lennon of Ireland was apprenticed to R Gray & sons of Uddington as a ploughmaker. In 1859 he migrated to Victoria. Hugh Lennon was employed by George Grant the pre eminent ploughmaker up to 1865. Whilst employed by Grant, Lennon studied the need of local farmers, and set out on his own in 1866. In Victoria, he saw the need for and produced a plough suited to the dry farming on the northern plains. One innovation was to use wrought iron body and patented cast steel mouldboard. His superior ploughs were in huge demand and by 1870, sales of his single and double furrow plows was phenomenal. Mowers were also produced and in1879 his “New Imperial Stripper” was patented, containing many of Lennon’s innovations. He also developed a winnower. The Stripper and winnower provided the best harvesting unit on the Australian market. By 1884, the firm was the largest of its kind in the Australian Colonies, selling 700 plows, 224 reapers, 60 strippers and many other implements each year. 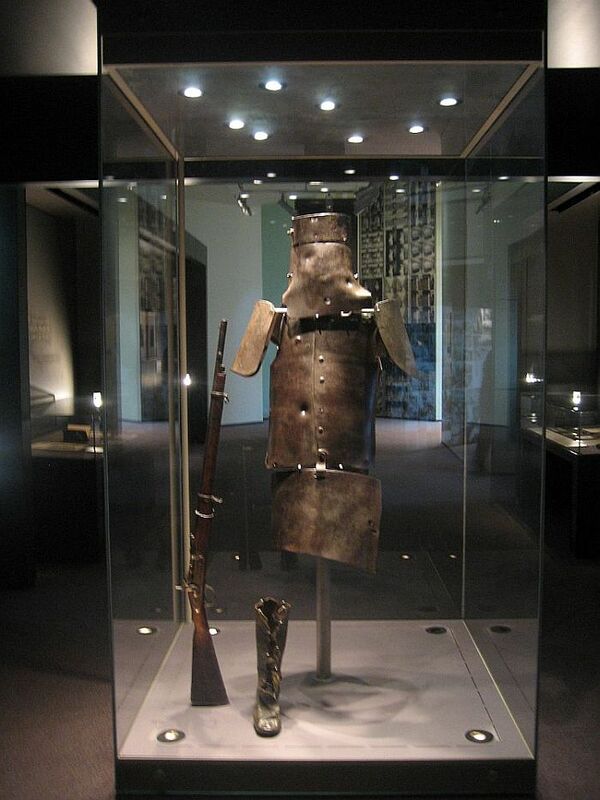 Hugh Lennon's ploughs have another famous link with Australia's history: the State Library have a display case with Ned Kelly's armour assembled in working position.The inside of two components of Ned Kelley's armour, are marked "H.Lennon Melbourne No 2." Another component of the armour is marked MA, which we have not been able to identify to date. These markings indicate that the armour was made from plough mouldboards and possibly other worn our agricultural components. © Steve Jager. see pictures benlow. Around 1949, Hugh Lennon Plow Company wes taken over by Baltic Simplex who were themselves taken over by Horwood Bagshaw in 1964. Lennon spanners found to date are 2 named malleable end spanners and several heavy plate types, probably drop forged, with integral hammers and the name deeply imprinted into the base metal, either on one side or both. 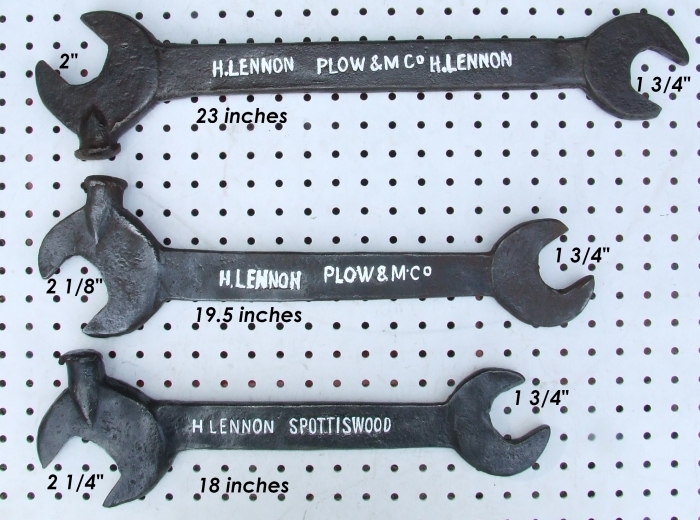 Spanners supplied by Lennon for his agricultural equipment, made of cast and malleable iron in Whitworth sizes. Examples of Lennon end spanners in heavy forged steel are not rare in Melbourne even now. 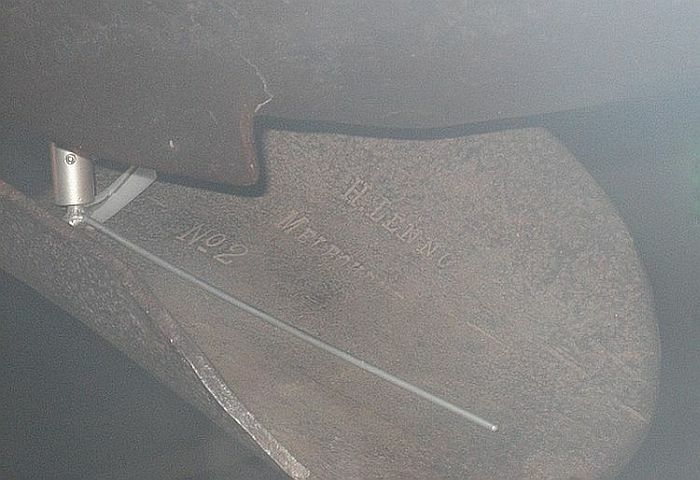 Above - Forged steel marked H LENNON SPOTTISWOODE or H LENNON PLOW AND M(machinery) Co. The largest is marked on both sides. 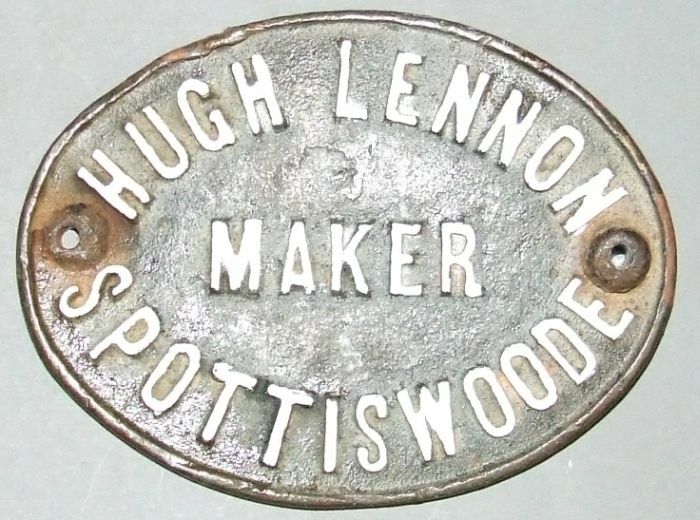 This malleable spanner marked "Cast Steel" is thought to be by Lennon also. plough, was found on the inside of the armour and also on the left shoulder plate. (see picture below). was made from plough mouldboards and possibly other worn our agricultural components. © Steve Jager.